If you're an Olympics junkie, then I have some bad news for you: closing ceremony is just around the corner, so you'll have to say goodbye to nearly constant coverage of the world's greatest athletic competition. While loving the Olympics is a universal feeling, what your favorite Olympic sport says about you varies from person to person. At this year's Olympic games in Rio, there are 306 events in 28 sports that all range from the most talked about, like gymnastics, swimming, and track and field, to the most obscure events, like Taekwondo, handball, and race walking. With over 11,500 athletes participating from countries all over the world, the 16-day-long event is a beautiful example of not only incredible talent, but of global community, cooperation, and respect. While each event is a breathtaking feat of athleticism in its own right, everyone has a favorite summer Olympic sport, the one thing they watch religiously from the qualifying round to the medal ceremony, and that favorite sport actually says a lot about you. The summer Olympics may only come around once every four years, but your love for the game never ends. 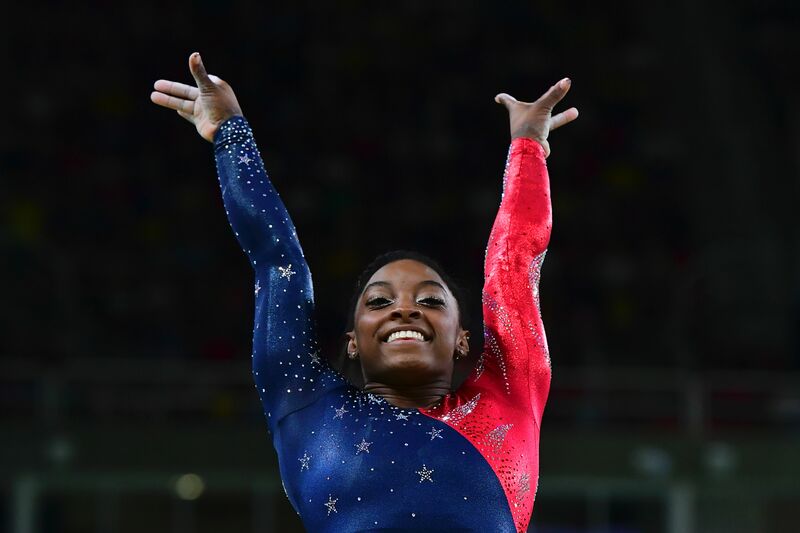 Whether you like cheering for Simone Biles and the rest of the incredible women of the USA gymnastics team, holding your breath while Katie Ledecky breaks another record, or jumping for joy with beach volleyball team Kerri Walsh Jennings and April Ross, you can be sure that your favorite event explains a lot about your personality. Here is what your favorite Olympic sport says about you. You're a flexible person who easily adapts to change. You are always willing to try new things, and you believe that variety is the key to life. If there's a new food or fashion trend, you're the first of your group to give it a try. While you thrive in a team environment in both work and social situations, you're also an individually driven person who achieves many solo successes. No matter how far you've come, you're always striving to go a few steps further, because you have the stamina to survive just about anything. You're a natural born leader who loves taking charge. Whether you're with your friends, at work, or spending time with family, you're usually the one in charge of organizing and planning, but you wouldn't want it any other way. Your favorite personal items include color-coded sticky notes and your meticulously marked planner. You aren't afraid of failure, and you never give up on yourself or your loved ones. While you strive for perfection for yourself and others, you still believe in second chances. A social butterfly who enjoys being the center of attention, you're a cool and confident individual. A bit cocky at times, you can let your ego get the best of you, even among friends. But despite your occasionally inflated head, you're a kind, hard-working individual who can stay calm and collected under even the most intense pressure. You know there's nothing like a big deep breath to help you clear your mind and find your zen place. A risk taker and daredevil at heart, you're not afraid to take chances. A bit of a showoff at times, you aren't afraid of attention. Despite your wild side, you know when to be calm, quiet, and collected. You respect the rules, but you aren't afraid to break them either. You're a perfectionist, so whether you're picking out an outfit, throwing a party, or organizing an event, you obsess over every last detail. Despite your need for perfection, you're a generally flexible person willing to bend to make other people happy. You're stylish, outgoing, and the best at everything you do — school, work, sports, you name it. You give everything 110 percent, and if at first you don't succeed, you work your tail off until you do. Quitting is not in your vocabulary. While you may like being at the center of attention all on your own, your favorite thing in the world is hanging with your friends. Your crew means everything to you, and you do everything together, from summer vacations to study sessions to paint nights. You're a disciplined person, so whether it comes to your early morning gym sessions or deadlines at work, you never miss an obligation. You are a goal-oriented individual always looking to score the next big thing in life, whether that means a promotion at work or your dream apartment. A true intellect, you're sharp, witty, and ready for anything. You're an active person who always likes to be on their toes. If you have a desk job, there's a chance that your desk is a standing one. You honor tradition, values, and mutual respect. Your interests include art, music, dance, and anything with a little friendly competition, physical or mental. You're a fun-loving person who is always down for a party. You like to travel and prefer a life of leisure, but you're no stranger to hard work. When you commit to something, whether it's a weekend getaway or a project at work, you give it everything you've got and then some. You know how not to sweat the small stuff and keep your cool in high pressure situations, and when in doubt, you know you have that one BFF that will always be there for you. You're a focused, driven individual who always has your eye on the prize. No matter what life throws at you or what is going on around you, you cannot be easily distracted. You're a goal-setter and a go-getter who never misses their mark. You're smart, sharp, and have a kind of sixth sense that alerts you to any big changes on the horizon. If the wind is going to change direction, you're the first to know. You're a big-picture kind of person, always taking a step back to see the whole thing instead of focusing on the minor details. All of your friends agree that you're great at giving advice because you can easily see both sides to every story. You're protective of your loved ones, but at times, that can make you a little closed off. The ones closest to you, though, know how to break past your defenses. You're competitive, hard-working, and even relentless at times. You wear your heart on your sleeve, and you aren't afraid to show your emotions, good or bad. You're a strong individual looking for a partner who can complement your strengths, and if you can't find someone who can keep up, you're happy to go solo. You're a bit of an attention seeker, but it's just because you love being around people. You have many close friends, and you never go anywhere without someone from the crew. You value trust, respect, and teamwork, and you're always willing to help out a loved one in need. You're constantly looking for a chance to move up in the world, whether it's in your social, professional, or personal life. You see the opportunity in every situation. You enjoy being in group settings, whether for fun or for work, and you enjoy being part of a team. You're always willing to pull your own weight, so if a friend or loved one is in need, they know they can count on you to be there. You're level headed, and when you make a plan, you stick to it. You know how to balance work and fun, and you're not one to rock the boat.